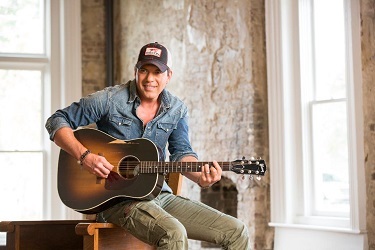 Though country singer Rodney Atkins didn't get his first guitar until one Christmas in high school, he took to the instrument instantly and was soon playing anywhere he could around his Cumberland Gap, Tennessee, home. While at college at Tennessee Tech in Cookeville, Atkins used the opportunity to go into Nashville as often as he could, and by the time he graduated, he was starting to make himself known as a performer in the area. In 1997, he signed to Curb Records and was set to release his debut shortly after, but when he didn't like the finished results and label head Mike Curb gave him the go-ahead to record new songs, Atkins spent the next two years working with various producers, engineers, and musicians for an album that would ultimately never see the light of day. He resurfaced, however, in 2003 with his true debut, Honesty, and three years later, If You're Going Through Hell, recorded in his home studio, came out. It's America arrived in 2009. Take a Back Road, Atkins' fourth studio album, appeared in 2011, led by the title track, one of that summer’s most memorable singles (complete with a George Strait name check) and it became Atkins' fastest-rising single to date.